The “Hokusetsu SATOYAMA International Workshop and Seminar” was held in the Hokusetsu region in Hyogo Prefecture, Japan on 27 and 28 November 2016. The event was organised by Hyogo Prefecture, the Asia-Pacific Network for Global Change Research (APN), the Institute for the Global Environmental Strategies (IGES) and Hokusetsu Satoyama Museum Steering Council, and co-organised by Itami City, in collaboration with the Museum for Nature and Human Activities, Hyogo and the IPSI Secretariat. The main theme of the event was “Who are to save SATOYAMA? What for?” This was the second such international event, organised after the first “International Symposium on Hokusetsu Satoyama” that took place on 30 November 2014 in Takarazuka City, Hyogo Prefecture. On the first day, participants of the workshop were invited to an excursion at Hyogo Prefectural Takarazuka Nishitani No Mori Park where local satoyama landscapes, including a traditional farm house with straw roofing, have been maintained. The excursion provided participants a wide variety of thoughts and ideas that were shared during the discussions at the subsequent workshop. Theme 1: Who are to save satoyama? How to engage more stakeholder groups with different backgrounds and interests in sustaining satoyama? Theme 2: What are the possible added values that are needed to sustainably maintain satoyama? Each thematic group was further divided into three small groups for breakout sessions. At the end of the day, each breakout group presented a summary of the group discussions to the other participants. The discussions revealed that while the Hokusetsu region has maintained satoyama landscapes in a traditional manner, participants including local people from different sectors acknowledge the abandonment of satoyama in the region at an exacerbated pace. Interestingly, participants also recognize a wide range of satoyama landscapes’ values in Hokusetsu region. These values are not limited to a monetary sense but include some non-economic ones such as well-being and social bonds in the community. 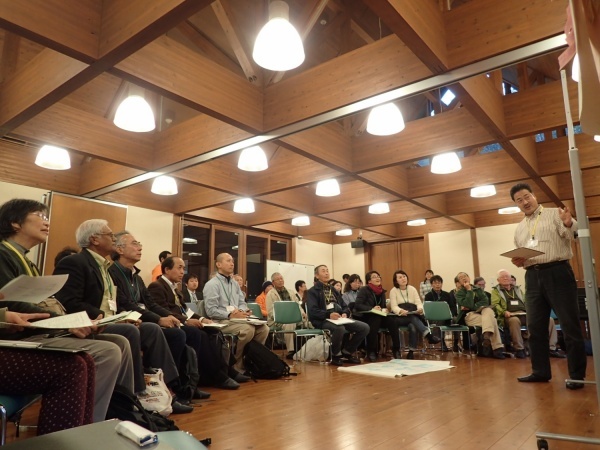 On the second day, the “International Open Seminar on Hokusetsu SATOYAMA” was held. The outcomes of the workshop discussions were reported by the facilitators, Prof. Hiroaki Ishida of the Institute of Natural and Environmental Studies, University of Hyogo, and Mr. Wataru Suzuki of the IPSI Secretariat. At the Seminar, Prof. Mitsuyo Toyoda from IPSI member the Centre for Toki and Ecological Restoration (CTER), Niigata University, delivered a keynote lecture on “Developing collaboration to nurture the SATO-environment”. Dr. Toyoda’s presentation focused on the platform of the dialogues amongst multi-stakeholders by giving examples from her own experiences including her fieldwork in Sado Island, Niigata Prefecture, Japan. Also, some representatives of IPSI members, Prof. Kuang-Chung Lee of the National Dong-Hwa University, Chinese Taipei, and Ms. Kien Dang of the Social Policy Ecology Research Institute (SPERI), Viet Nam, were invited to present case studies from their on-the-ground experiences. Other highlights include a keynote lecture titled “SATOYAMA conservation under multiple stakeholders’ participation” by Mr. Kosuke Motani, Chief Researcher of the Japan Research Institute and the author of the best-selleing book in Japan titled “Satoyama Capitalism”. His presentation touched upon the danger of abandonment of satoyama landscapes and its consequences but also emphasized possible innovative uses of underused satoyama resources, including wood resources that can be transformed into wood pellets for fuel in stoves or architectural materials called “Cross Laminated Timber” (CLT) by utilizing state-of-the-art technologies. For other case studies, Prof. Nimal Gunatilleke, Emeritus Professor of the University of Peradeniya, Sri Lanka introduced the Kandyan Home Gardens and shared successful cases of combining traditional spice cultivation and land use with modern economic activities in sustainable ways. 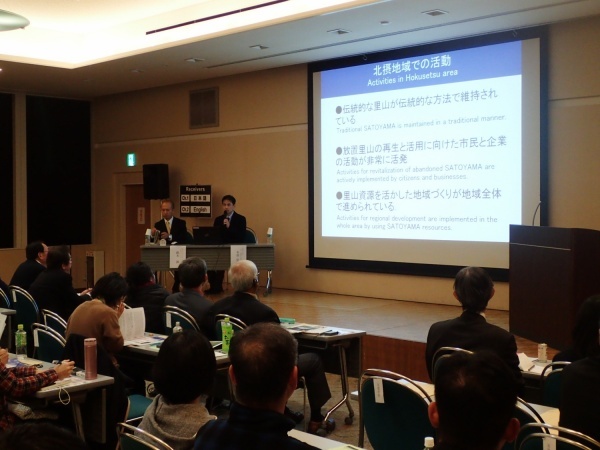 There were also two cases presented by two speakers from local NGOs at the seminar, elaborating examples of local activities in the Hokusetsu region.